Nicole R. Brook is the Chief Financial Officer of Leisure Financial Group. 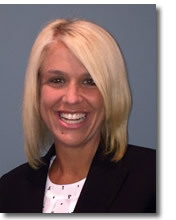 Nicole is responsible for the accounting, financial planning and operations for Leisure Financial Group. She assists the Business Development Team in origination requests and underwriting as well as closing and servicing loans. Nicole has 13 years of commercial real estate experience. Prior to forming Leisure Financial Group, Nicole spent 17 years with Textron Financial Corporation, most recently as Vice President and Group Controller of their Golf Finance Group, which included Hotel, Golf Mortgage, Marina, and Golf Equipment Loans and REOs. Nicole was a member of the senior management team in the Golf Finance Group, where she was responsible for all financial planning and accounting in accordance with GAAP. She managed various levels of accounting and finance professionals over her finance career. In addition, Nicole served as the Chief Financial Officer for Great Oaks Golf. She oversaw all of the accounting and financial responsibilities for Hotels, Resorts and Golf and worked directly with third party management company’s Controllers. Prior to joining the Golf Finance Group in Alpharetta, Georgia in 2007, Nicole worked in Textron Financial’s Corporate Office in Providence, Rhode Island as the Director of Financial Planning & Analysis. She was a Member of the Executive Committee where she was responsible for the overall planning and budgeting for the Company as well as executing the strategy and mission. Nicole is a graduate of Bryant University where she received a Bachelor of Science degree in Business Administration. She is a certified Six Sigma Black Belt and completed The Strategic Partnering for Finance Leaders at The Wharton School of Business.